I prefer the subtle, yet genius approach. Look no further than Pinterest for more disgusting options. If you're just going to paint your tummy, you gotta find an artist to help you out (unless you think you can do a good job of it looking in a mirror). 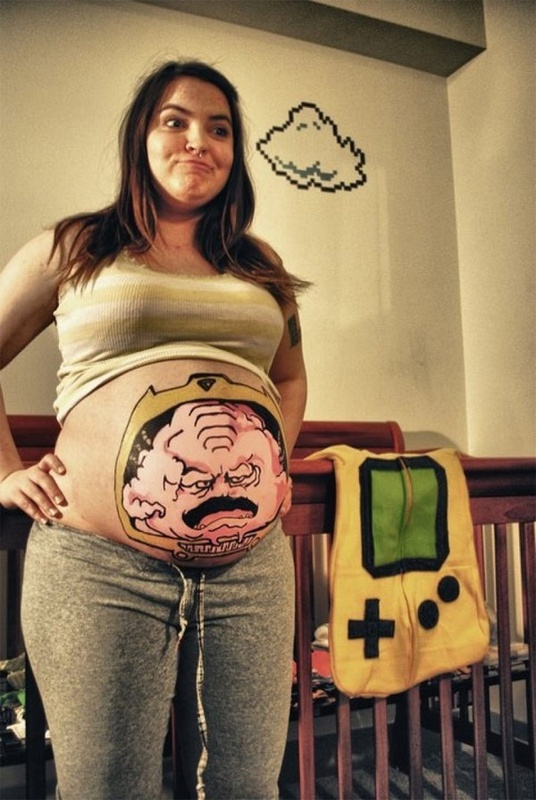 Also, Krang from Teenage Mutant Ninja Turtles is the only way to go. I have yet to see someone pull off a M.O.D.O.K. 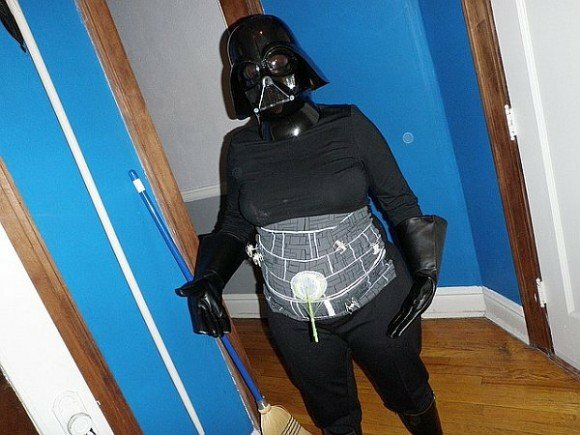 More than just a painted bump, you can add Darth Vader or Imperial Officer costume pieces for a little more geek fun. And don't forget to add a tiny spaceship or laser. This has been seen in at least three different variations, which you can find here on Pinterest. This would be a great cosplay for a couple! 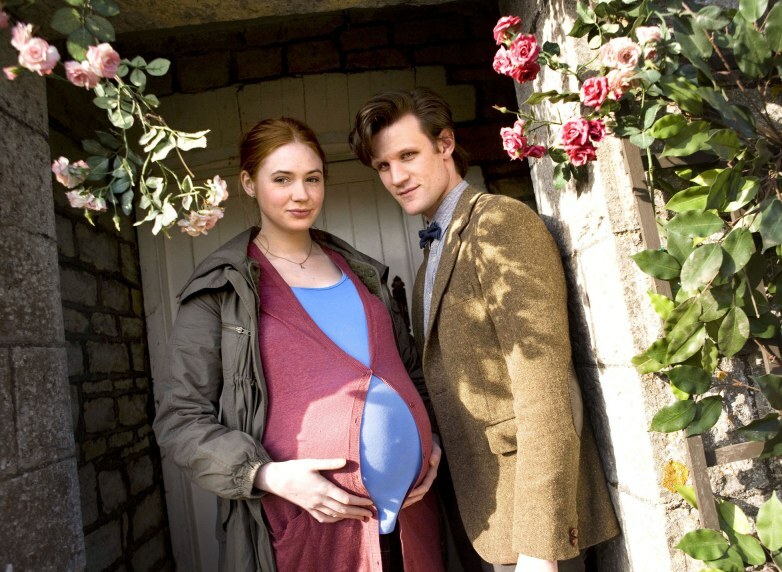 Since Amy's costume looks like mundane clothes, you really need a Doctor or a Rory with you to help put it in context to pull it off well. Also, you need some fabulous ginger hair and a cute Scottish accent. Pregnant Bella from Twilight could also be acceptable, but only if your costume includes a bloody vampire baby bursting out of your bump. Padawan's Guide has an excellent list of her costumes with reference pictures including fan-made replicas and close-up hi-res costume exhibit photos. My favorite would be the "Sleeveless" outfit. I mean, how cool is this? It's action-hero maternity wear! Sure, you can always wear a loose nightdress or a cloak, but the best maternity outfits include leggings and knee-high boots, IMO. The top of the dress is flattering and form-fitting, curving under the bust and then giving you lots of room in the tummy area for any stage of pregnancy. Heck, this outfit would even look good on someone that's not pregnant. All you really need to make to pulls this off is the dress with harness (including the sculpted brooch details) and a pair of fingerless gloves. Buy a pair of off-while/taupe leggings and brown boots that fit. The hair is a little tricky if you don't have long hair, but you could fake it by pulling your hair back and adding a custom braid extension. This type of extension shouldn't be too difficult to make, even for someone like me who is not a hair stylist. Alternatively, you could get a super-long dark brown anime wig and style it. Good idea. I know someone locally has done the Padme but is no longer active. Seems like a pretty easy Padme costume but alas, I didn't have time to work on one before Emerald City Comicon.